How mobile is your music listening? 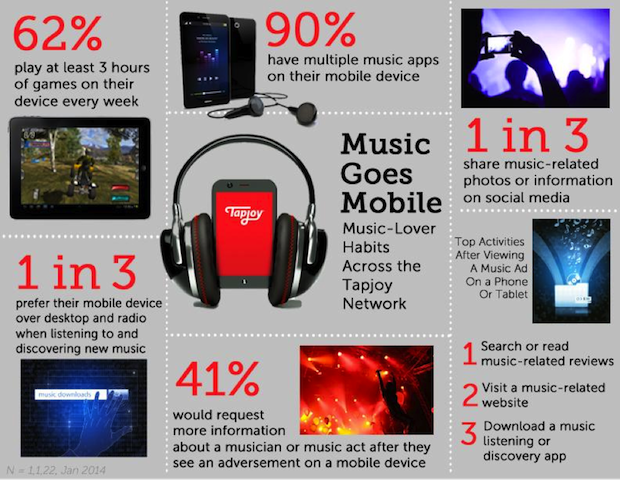 Tapjoy published an infographic earlier this year on the habits of music fans when it comes to their mobile devices, and the stats are pretty eye-opening. For example, did you know that 90 percent of mobile device owners have multiple music apps installed? Or how about that one in three people prefer using their mobile device to discover and listen to new music rather than desktop or radio? And perhaps most significant for us musicians, almost half of users would request more info about an artist or band after seeing an ad for them on their device. There's no doubt that music is going mobile – so if you haven't already started adapting your strategy to reach music fans on mobile devices, now would be the time!